Japanese director Minoru Kawasaki is best known for offbeat, quirky films like The Calamari Wrestler, The Rug Cop, and The World Sinks Except Japan. 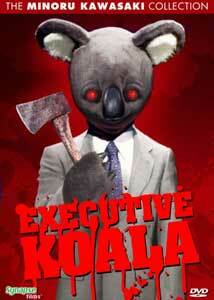 His latest film sure doesn�t stray far from his usual formula, as you can probably tell by its title, Executive Koala. Upon hearing the it, my head raced with preconceptions of how someone would bring something with such a title, to the screen. Kawasaki didn�t do the obvious, and present his subject in an animated form, though, instead, making his protagonist a man in a giant koala costume. Now, everyone can enjoy the quirkiness of the film for themselves, as Synapse brings it to DVD. Tamura Keichi (credited as simply Koala) is an executive for a Japanese corporation that sells pickles. He has orchestrated a proposal of a merger between his company and a Korean kimchi manufacturer, and his boss (a white rabbit) has green-lighted a meeting between the two. This leads to Keichi�s initial encounter with Mr. Kim (Lee Ho) and his pet flying squirrel, Momo. However, when Keichi�s current girlfriend, Yoko (Elli-Rose) is murdered, he is questioned as a prime suspect by detectives Kitagawa (Eiichi Kikuchi) and Ono (Hironobu Nomura). Their investigation, along with Keichi�s frequent visits to Dr. Nonaka (Arthur Kuroda), slowly uncover the truth about the fate of his one true love, Yukari. I tried awfully hard to look past the campiness, and just plain overall goofiness of the film but I couldn�t do it enough to enjoy it. Don�t get me wrong, seeing the main character basically dressed up in a koala outfit during the entire film was great, but it was the overriding strangeness of the editing and surrounding set pieces that kept me from getting on board with the director�s vision. I�m all for edgy, surreal filmmaking, but in this case, the quality of the story and film, overall, is compromised for the sake of being different. The performances are difficult to critique given the fact that we get a mix of human actors and human actors in animal costumes. The actor in the koala suit can�t exactly use his face to his advantage as most performers do, but he does a fine job with arm movements and even some pantomime to express his emotions. The humans without costumes should also be commended for interacting seamlessly with their costumed brethren. I imagine this is akin to acting in animated/live-action mashups, or even, to some extent, working with green-screen effects. Still, the ability to come across as acting natural when your coworker is in a giant koala costume can�t be easy, and everyone, from Elli-Rose to the pair of detectives, pull off their scenes with the koala quite convincingly. Executive Koala is a polarizing film, with its audience either buying into the protagonist in a koala suit gimmick or not. Despite my distaste for the picture, I�m still recommending it to any film buff with an open mind, as you simply have to see what Kawasaki can pull off with such a quirky idea. Oddly enough, the first film that came to mind when I first saw the koala costume was Peter Jackson�s puppet fest, Meet the Feebles. While there weren�t any human actors in that movie, it still came to mind, if only as an example for what Kawasaki�s ideas could have materialized into. Instead, he made a valiant, interesting effort that just barely missed the mark. Image Transfer Review: Presented in anamorphic 1.85:1 widescreen, the film features plenty of sharp, detailed images throughout. The colors are bright, with vivid hues, deep blacks, and consistent contrast levels. Fortunately, dirt, grain, and other blemishes are kept to a minimum. Audio Transfer Review: The Dolby Digital 2.0 audio is mostly dialogue-driven, although the sound field is opened up during the action sequences near the end of the film. The aforementioned dialogue is always crisp, clear, and never overcome by any of the other audio elements. Extras Review: For extras we get the original theatrical trailer for Executive Koala, a TV Spot, and the Making of Executive Koala. This 39-minute piece is an extensive exploration of the movie�s entire production, featuring cast and crew interviews, as well as on-set footage and even a look at some of the rehearsals. This is a great documentary that is well worth the time to check out. If you�re looking for a foreign-language movie starring a man in a koala suit as its protagonist, then Minoru Kawasaki�s Executive Koala is the film for you. While the movie turns out to be more wacky then endearing, it should still appeal to fans of off-the-wall Japanese cinema. Synapse�s DVD makes it easier to like as it features solid audio and video presentations, and a nice making-of piece.